Earlier this week, I wrote a piece on continuity, openly wondering whether or not it matters any more for readers of Marvel and DC titles. For an array of reasons – all of which you can see in more depth in that piece – I shared that it doesn’t for me. I’d rather have good stories told by good creators without asking them to be beholden to the stories and actions of those who came before them. But what do other readers think? I found out by including a poll in the piece, the results of which are below. Only 37 people responded to the poll – come on! – but it’s still an interesting little insight into what comic fans think. And the majority of them think that continuity matters, or at least for the most part. 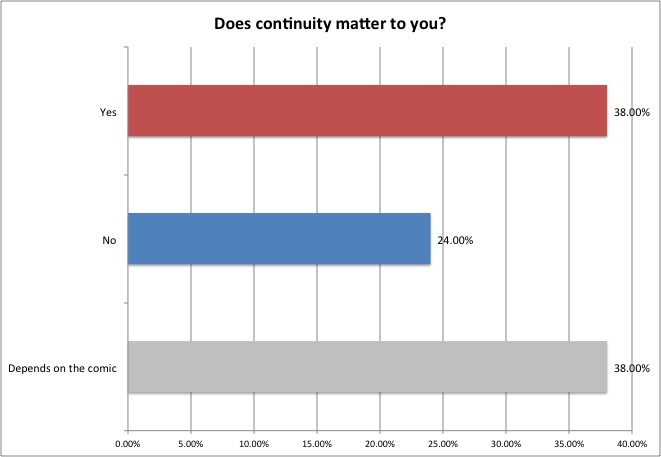 76% of the respondents either think continuity matters or that it does depending on the comic. That makes sense given how the vast majority of comic readers are fans of Marvel and DC, and that those books are the ones most dependent on continuity. The most interesting part of this though were the responses from the people who expanded on their answers. You can read some of the responses below, all from anonymous contributors. “Continuity and the obsession with it has long been the bane of comic books as published by the big two. The customer who only picked up a book every now and then was lost. A lot of this has to do with bad writing and a hell of a lot with lousy editing. There are too many entertainment choices out there for the casual buyer to spend his money on if he decides that he doesn’t want to waste his time on a story that requires too much knowledge of past events for it to make sense. In his mind he hasn’t got the time. The problem is that the companies have constantly catered to the fanboys (or baby men as Mike Manley often refers to them) to the extent that mainstream comics has become a clubhouse, closed to “outsiders”. I especially enjoyed the final answer, perhaps because it sounds like I may have written it (I swear I didn’t!). I agree entirely that comics should change its focus from the fanboys who are already in the bag and instead focus on the much more vast audience outside of comics. Hell, I wrote about that very concept earlier this week. But if I learned anything from this exercise, it’s that I’m in the minority on that line of thinking. That said, I do agree with the first respondent as well. Perhaps it isn’t that I don’t like continuity. It’s that I just like poorly crafted applications of it. All interesting thoughts regardless, and thanks to the readers for sharing.